How do you top a couple that recreates movie scenes with their adorable baby? 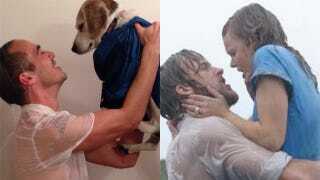 By recreating famous scenes with a dog. Yeah, it's beautiful inspired work that should make us all want to grab our pet best friend in a warm embrace like Gosling did to McAdams. Redditor user mmsspp is the awesome guy in these photos and the dog, Wrigley, actually belongs to his boss. His boss started bringing Wrigley to work recently so he naturally decided to recreate romanic scenes from famous movies. The scenes are all pretty much perfect. You can see more here.